I had originally wanted to write a post on this a year ago when Pure was on everyone’s lips and NetApp was racing to catch up in the Solid State Array category. I had meant to write about how bad NetApp had been at Marketing their portfolio, but in 12 short months they’ve forced me to make this a turnaround story. I was at a partner event a couple of weeks ago and one of the speakers talked about how customers kept asking him, “What is NetApp’s story around Hyper-Converged?” Now, I won’t go into my thoughts on Hyper-Converged on this post, but what struck me the most was that the customers were specifically asking for a story. Considering what happened in our country last week I think our need for having information explained to us in the form of storytelling is more important than ever. That’s all Marketing is, storytelling. How well can you tell your story so that your customers want to hand over their hard earned cash. 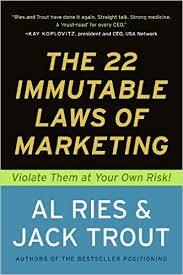 If you haven’t read “The 22 Immutable Laws of Marketing” go do it now. Ok, now that you’ve finished it I don’t have anything else to say. Kidding, it really is a good read and even if you don’t think you’ll ever use Marketing in your day job there are so many good gems that you can apply and use in every walk of life that it’s worth your time. Despite the title, not every one of these laws is set in stone and I’m sure there is an exception to every rule. Generally the laws I discuss below hold up under scrutiny, or they might not. That’s part of the fun. I thought it would be fun to pick out a few of these laws and see how they apply to NetApp’s resurgence in the Solid State Array market. Let’s get started. Law of Leadership: It’s better to be first than it is to be > better. I thought it would make sense to start with the first law mentioned in the book as it pertains to this post. 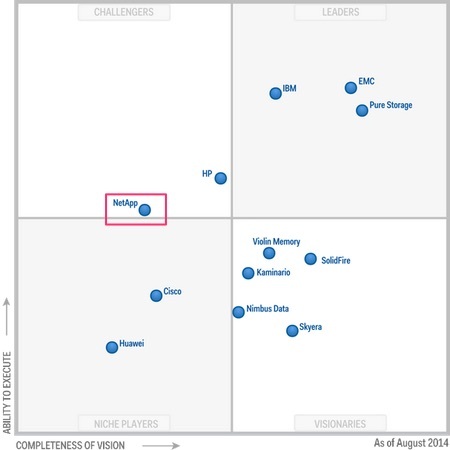 NetApp was barely in the Gartner Challenger Quadrant in 2014. Take a look at the leaders and tell me what you see? EMC (XtremIO) and Pure are leading the pack. I won’t get into semantics about solid state array or all flash arrays here but what I did want to point out is that both Pure and XtremIO were arguably 1st to market in this space and have held on to a comfortable lead. I’ll be the first to extoll the virtues of NetApp products and engineering. I’ve dealt with numerous data storage technologies in the past and 9 times out of 10 I’ll recommend NetApp for storage solutions. In spite of all that, NetApp was late to the table in terms of an all flash array offering. As the book points out, people tend to associate “best” with “first”. Once that association happens, it’s hard to supplant. That being said, NetApp’s jump to claim 22.8% of the all flash array market in just a year is remarkable. EMC still has a comfortable 30.9% market share but we’ll see what next year brings. Law of Perception: Marketing is not a battle of products, it’s a > battle of perception. If there is a law that perfectly sums up the all flash array market it’s this one. The book eloquently states, “All that exists in the world of marketing are perceptions in the mind of the customer or prospect. 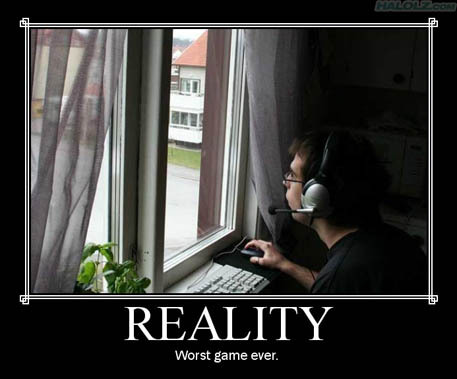 The perception is the reality. Everything else is an illusion.” I can’t tell you how many times I heard customers say, “But Pure built their product from the ground up, NetApp doesn’t have a ground up all flash array.” You can throw all the SPC-1 benchmark statistics and speeds and feeds #’s you want at a customer, but the bottom line is what do they perceive about your product and the competitors product. Ask anyone who’s tried to have an intelligent conversation about last week’s US presidential election and you’ll find out that perceptions are extremely hard to change. The Law of Candor: When you admit a negative, the prospect will > give you a positive. This one is a hard pill to swallow. Especially in today’s image driven culture. No one wants to admit anything negative lest they appear weak. I have to give NetApp credit for this one. I remember hearing Dave Hitz admit they were slow to the all flash market and that they had made a mistake. (See his presentation here, at Storage Field Day 9 for more.) I heard the same message from sales and engineering. I’m sure that was a very hard thing to admit but I think it truly resounded with customers. As mentioned in the book, admitting a mistake is very disarming. Once you’ve opened up, it gives the other party a chance to drop their mental barriers to your product, service, etc. I personally think this was a big driver of NetApp’s flash resurgence in the past year. The laws mentioned above are only a taste of what the book goes on to explain in-depth. Hopefully this helps you sell your skills to a potential employer, help you decide what your next move in the market is, or hit reboot on that disaster of a product launch. At minimum you could add it to your ever increasing “Must Read” list.